Keysafe securely backs up a gpg secret key or other short secret to the cloud. This is not intended for storing Debian Developer keys that yield root on ten million systems. It's about making it possible for users to use gpg who currently don't, and who would find it too hard to use paperkey to back up and restore their key as they reinstall their laptop. Not yet ready for production use! Needs security review! May run over your dog! Not suitable for bitcoin keys! The secret key is encrypted using a password, and is split into three shards, and each is uploaded to a server run by a different entity. Any two of the shards are sufficient to recover the original key. So any one server can go down and you can still recover the key. Keysafe checks your password strength (using the excellent but not perfect zxcvbn library), and shows an estimate of the cost to crack your password, before backing up the key. Keysafe is designed so that it should take millions of dollars of computer time to crack any fairly good password. (This is accomplished using Argon2.) 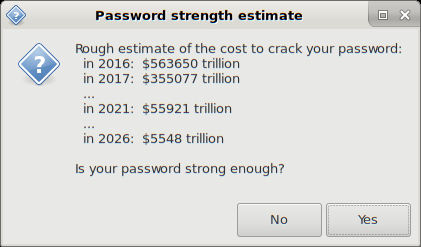 With a truely good password, such as four random words, the cracking cost should be many trillions of dollars. The password is the most important line of defense, but keysafe's design also makes it hard for an attacker to even find your encrypted secret key. For a more in-depth explanation, and some analysis of different attack vectors (and how keysafe thwarts them), see details. Also, there's a FAQ, and a video explaining keysafe. Updated to http-client 0.5.3, servant 0.11, and stackage lts-9.0. Keysafe is now available in Debian experimental. Install it from there, or from source. All tags and commits in this repository are gpg signed, and you should verify the signature before using it. Note that there is a manpage, but stack doesn't install it yet. See servers for information on the keysafe servers. Thanks to Anthony Towns for his help with keysafe's design.